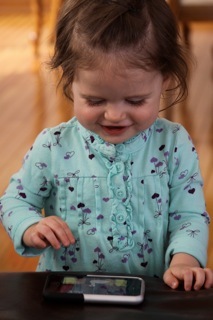 my 14 month old niece and i have something in common: we both love to play on my iPhone. lately, whenever i’m with her, i hold the phone while she scrolls through the pictures, then we play a few games on the apps – her favorite is barnyard animals, and we always use the camera to take a picture of us. my niece learned how to use the iPhone before she learned how to walk. 1. “american children now spend 7.5 hours a day absorbing and creating media – as much time as they spend in school. even more remarkably, they multitask across screens to cram 11 hours of content into those 7.5 hours.” (fast company p. 68). if this is true, we need a new starting place for our learning methods in the church. what if we approached our methods from this perspective: instead of assuming paper activities, we started by asking what technology tool (computer, iPod, iPad, etc) could be used to deliver the best content? of course, we won’t allow technology to sacrifice relationships, or to be used just to say that we used technology, but if it really is the best way to pass biblical information and faith application onto this generation of children, then we have to approach our curriculum in a new way. i believe we’re on the edge of something very new for teaching children in the church. and i’m hopeful that together we can create a new church learning experience for children! additional resources: rewiring ministry for the digital learner by matt guevara, something digital this way comes by henry zonio,digital natives from harvard university. Fast Company is referring to the Kaiser Report from a few years ago. It’s important that we adapt, but I think we can be in danger of adapting poorly. I think the principles we need to borrow from media are “non-linear” and “customization.” It’s a wrong turn when we think we need to place a child in front of a screen to the point they become passive learners. thank you, christopher for the comment! would love to hear what connected about the post within your context. larry, thank you for referencing the kaiser report. i completely agree w/your comment – non-linear and customization are exactly the shifts we need to make w/our cm curriculum. and i would say that some of the current methods (non-media related) we are using on sunday morning are already encouraging passive learning. media or no media, we must always be creating learning environments for children to think, process and be transformed.